The Bear Creek Folk Festival is located in Muskoseepi park, minutes away from downtown Grande Prairie. >> Google Maps. The neighbourhood north of 101 Ave and east of 106 St. is restricted to local access only. Grande Prairie Regional College (all public lots except for lots G and J). 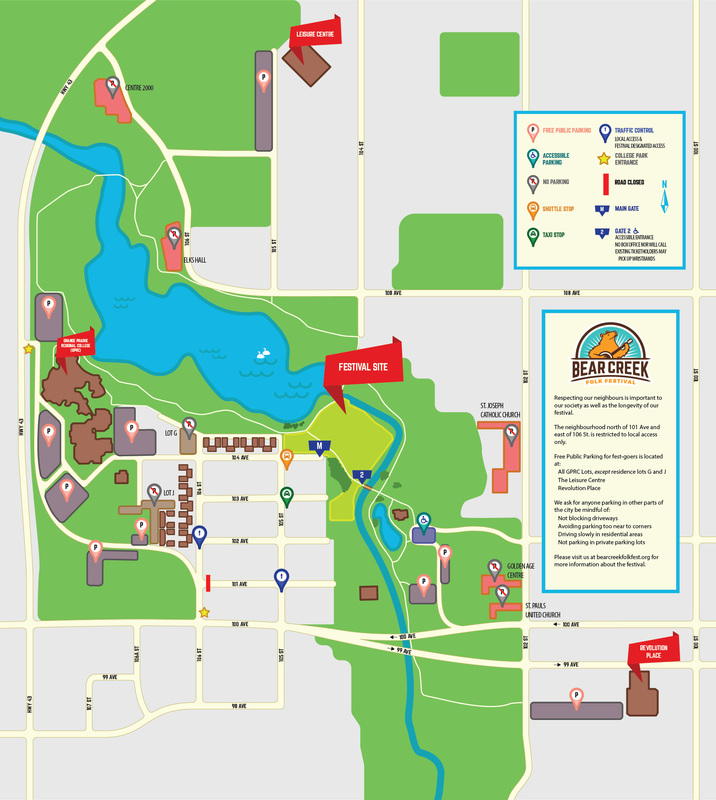 Persons with low mobility are best to park in the Muskoseepi pavilion parking lot, and enter the festival via Gate 2. Even though Gate 2 does provide box office services, our volunteers will help those with accessibility needs with ticket purchases and/or will call. Respecting our neighbours is important to our society as well as the longevity of our festival. The City of Grande Prairie’s Public Transit is providing free bus rides on festival days for fest-goers. All-Weekend wristbands are eligible for transit rides Friday through Sunday. Daily wristbands are valid their respective days. Some bus routes have limited times for final runs, included shorter service on Sundays. To view transit schedules, click here. Get home safely! The festival has a taxi stop on the corner of 105 St. and 103 Ave.